Dino Pedreschi (male) is a Professor of Computer Science at the University of Pisa, and a pioneering scientist in mobility data mining, social network mining and privacy-preserving data mining. His research focus is on big data analytics and mining and their impact on society. He is a founder of the Business Informatics MSc program at Univ. Pisa, a course targeted at the education of interdisciplinary data scientists. 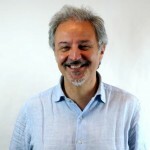 Dino has been a visiting scientist at Barabasi Lab (Center for Complex Network Research) of Northeastern University, Boston (2009-2010), and earlier at the University of Texas at Austin (1989-90), at CWI Amsterdam (1993) and at UCLA (1995). In 2009, Dino received a Google Research Award for his research on privacy-preserving data mining. D.P. served as vice- rector at Univ. Pisa (2000-2002), in charge of implementing a comprehensive reform of the educational system at undergraduate and graduate level. D.P. is the author of many influential publications (more than 200 in total). Mining Laboratory, a joint research initiative of the University of Pisa and ISTI-CNR founded in 1996, one of the earliest research lab centered on data mining, and currently counts around 25 among researchers & postdocs.